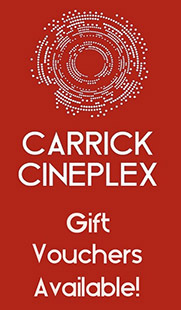 At Carrick Cineplex we offer fantastic career opportunities for enthusiastic people who want to go places in life! Call 071-9672000 to find out about our current vacancies. We advise all customers to pre-book for all shows. We advise customers to collect ticket’s from the box office a minimum of 15 mins in advance especially during busy periods so they can best choose their seats. All shows are free seating unless otherwise advised. Reserved seating can be arranged for bookings of 8+, please phone the box office to arrange on +353 71 9672000. T&C’s apply. Sign-up to our Newsletter for all the latest information.